This rustic wooden box sign - with its old-school, stencil-style lettering, stylishly faded paint and realistic weathering - looks fantastic on any wall, mantle, shelf or practically anywhere you place it, and, best of all, it expresses an amusing, eye-catching message. 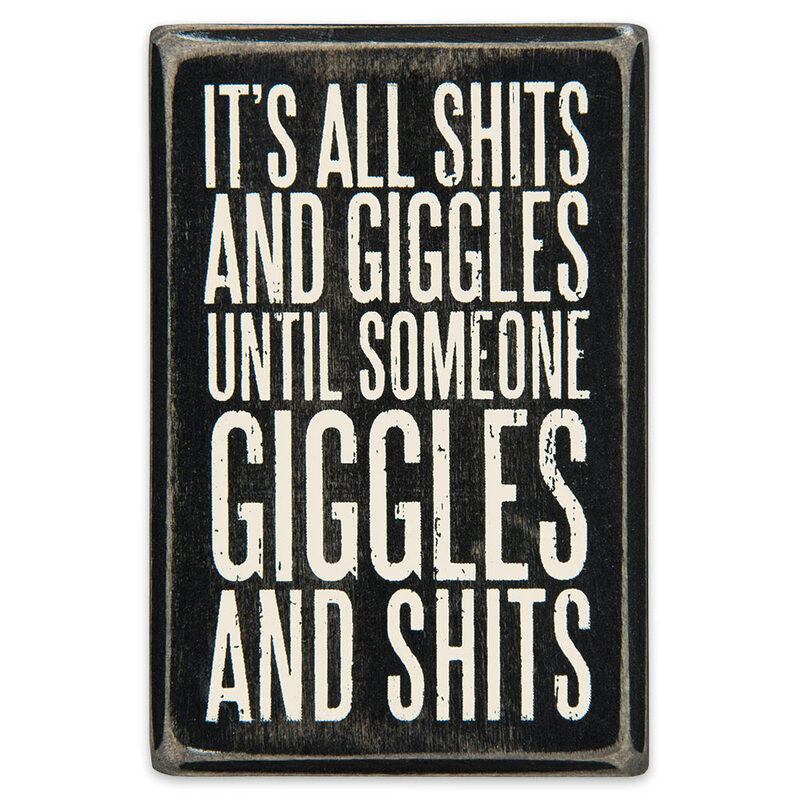 “It's All Shits and Giggles Until Someone Giggles and Shits,” it reads. What a hilarious message! The off-white, weathered stencil letters are emblazoned on a background of tastefully faded black. At 3” long x 4 1/2” high, there’s really no wrong place to put this handsome piece of vintage-style décor. It livens and adds a touch of humor and traditional rural grace to any living room, bedroom, kitchen, dining room, den, office, garage, barn – the list goes on. Get two – one for your own home, one to gift to a fellow wine enthusiast or drinking buddy. Thankfully, it’s easy and painless with our unbeatable prices! You’re sure to chuckle every time you glance at this funny-yet-stately Rustic Wooden Box Sign.